I don’t recall ever seeing pictures of World War I chaplains with any kind of chaplain kit or field altar. The early 20th century did not have a well-formed Chaplain Corps so it would not be surprising to not have standard issue items for worship in the field. The Roman Catholic Church, however, did provide their chaplains with a kit which is very similar to the one Catholic chaplains used in WW2. Until May 1918, chaplains were assigned only as low as the Regiment level. The law that went into effect in May 1918 permitted a chaplain for every 1200 Soldiers, but these positions didn’t get rapidly filled in the AEF. Organizations like the Salvation Army, Y.M.C.A. and the Knights of Columbus sent “chaplains” to the war zone to help provide for the spiritual needs of the deployed Soldiers. Once authorized, many of these ministers received commissions and were assigned to units already deployed. The Homan’s Sick Call Outfit. This box was apparently part of the kit used by a Catholic chaplain or minister assigned to the 23rd Infantry Regiment. The accoutrements pictured here aren’t original to this particular box but were the standard accessories of the outfit (author’s collection). The back of the box of a Homan’s Sick-Call Outfit. 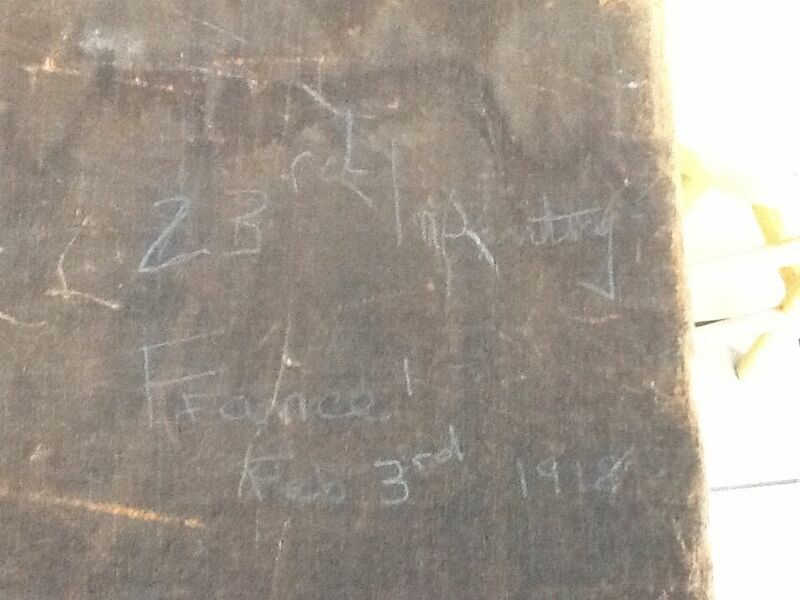 On it, written in pencil is: “23rd Infantry, France, Feb 3rd 1918” (Author’s Collection). I came across an interesting box which caught my eye because of what was written on the back. Written in pencil was, “23rd Infantry, France, February 3rd 1918. The 23rd Infantry Regiment was in France at this time (the main body arriving in October 1917) and was part of the 3rd Infantry Brigade of the 2nd Infantry Division. They were involved in several significant battles including the Battle of Château-Thierry in July 1918. 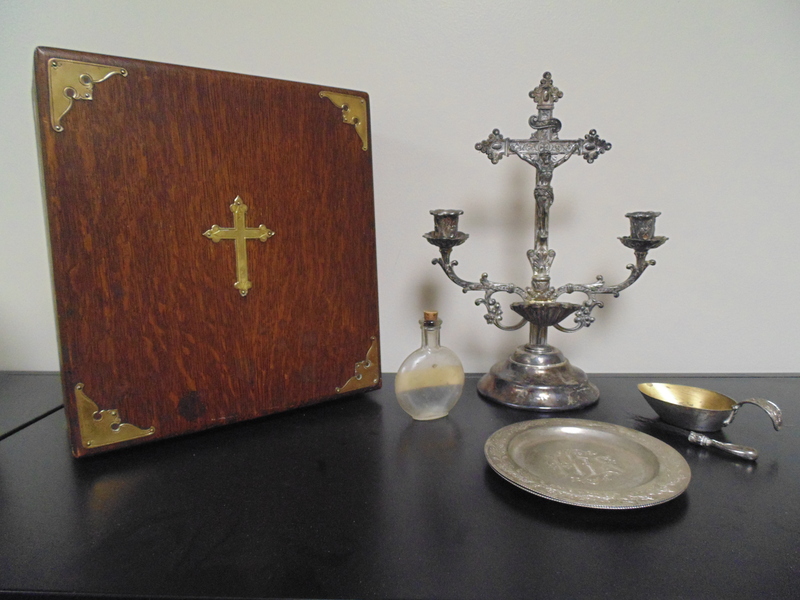 This box was part of the “Homan’s Sick-Call Outfit” which was patented in 1897 and advertised as “provid[ing] everything needed by the priest for the edifying administration of the Sacraments in the home” (from an 1897 advertisement). It’s not unreasonable to assume that this kit may have been taken to theater by a Catholic minister either sent by the Knights of Columbus or as an official chaplain in the Army, being a smaller and more portable kit than the ones provided by the Church. From my research, it appears this may have been used by Chaplain Julius Babst who was a Roman Catholic chaplain assigned to the 23rd Infantry Regiment. The fact that his award citations and military records indicate that he was in the 23rd on the date written on the box; he was a Roman Catholic chaplain and this box was produced for Catholic use; the box came from an estate where there were other items from the 23rd Infantry Regiment and was in California where Chaplain Babst died; all lead me to conclude that the likelihood is high that Chaplain Babst took this box to war in France and probably used it to perform the sacraments for Soldiers in his unit. 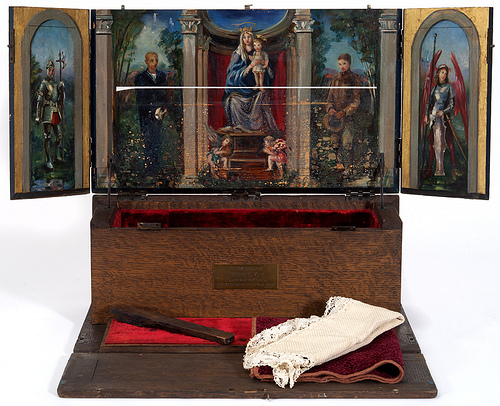 “Portable altar with three panels that fold into a compact, fabric-lined carrying case with a leather strap handle. Used by Father George R. Metcalf of St. Paul, Minnesota. Metcalf served as chaplain for General George S. Patton during World War II. The style of the military uniforms depicted in the painting suggest that the altar was originally used during World War I” (In the collection of the Minnesota Historical Society). Chalice and paten from Chaplain Francis Duffy’s kit, on display at the U.S. Army Chaplain Corps Museum, Ft. Jackson, SC (photo: Daryl Densford). I have I believe, is a ww1 field alter chaplains kit. It looks very similar to the one pictured. The one difference is the box. The one I have has 2 doors. Hello Ron, thanks for stopping by! Your kit sounds nice! 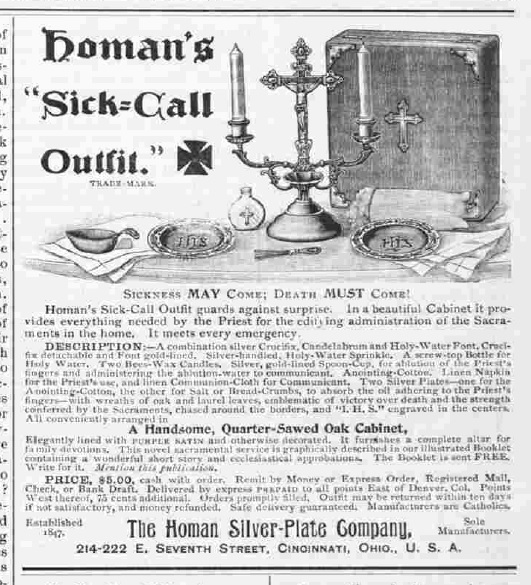 If the kit you have is what I think, both yours and mine were civilian “Homan Sick Call Outfits” patented in 1897 but very well could have been taken to war by Catholic chaplains since they’re smaller than the large worship/Eucharist chaplain kits that would have been more common. I have my Grandfathers WWI Battlefied Communion set. Wonder what you could tel me about it. U.S. Army 1918 Used in France. Have pics but was not able to upload.